Dr Shay Loya taught at the University of Durham before joining City University London in September 2012. He received his BA (2000) and MA (2001) from Tel Aviv University and his PhD (2006) from King's College London where he completed a thesis entitled 'The Verbunkos Idiom in Liszt's Music of the Future'. The PhD thesis was about the modernist and crossover aspects of Liszt's Hungarian-Gypsy musical style (verbunkos idiom), as well as its problematic reception history. Several articles and reviews followed, culminating in the monograph Liszt's Transcultural Modernism and the Hungarian-Gypsy Tradition (Rochester: University of Rochester Press, 2011), which won the Alan Walker Prize (2014). His most important recent article is 'Recomposing National Identity: Four Transcultural Readings of Liszt’s Marche hongroise d’après Schubert' (Journal of the American Musicological Society, 2016). Several invited talks and published/in press book chapters followed, and currently he is working on a monograph provisionally entitled 'LIszt's Late Styles'. Apart from Liszt, Dr Loya is more generally interested in Hungarian music, exoticism, nationalism, modernism, transculturation and its application to music analysis, and bridging the knowledge gaps between the musicological disciplines. He is a Trustee of the Society for Music Analysis, a Board Member of the journal 'Music Analysis', and the organiser of the international conference CityMAC2018 (City, University of London, 4-7 July 2018). Dr Loya is the author of Liszt's Transcultural Music and the Hungarian-Gypsy Tradition (University of Rochester Press, 2011). He has presented papers in numerous international conferences, most recently two papers this year (2015) in KeeleMAC (Keele University) and the Institut für Musikwissenschaft in the University of Leipzig. He co-organised the international conference 'Tonality in Perspective' (King's College London, 27-29 March 2008) and several student conferences and events as a committee member of the Society for Music Analysis. He is a board member of the journal Music Analysis. He has received numerous awards for his studies and research, including KCL's School of Humanities Award and ORS scheme (which funded his PhD in 2001-4), a Wingate Foundation Scholarship for independent postdoctoral study (2006), as well as the AMS 75 PAYS Subvention and the Alan Walker Prize for his recent book. Loya, S. (2011). Liszt's Transcultural Modernism and the Hungarian-gypsy Tradition. University Rochester Press. ISBN 978-1-58046-323-2. Loya, S. (2019). Neither Major, nor Minor: The Affective Fluctuating Third in Central-European Art Music ca. 1840–1940. In Hinrichsen, H.-.J. and Keym, S. (Eds. ), Dur vs. Moll: zum semantischen Potenzial eines musikalischen Elementarkontrasts Vienna, Cologne and Weimar: Böhlau. Loya, S. (2019). Virtuosity in Liszt's Late Works. In Doran, R. (Ed. ), Liszt and Virtuosity Rochester: University of Rochester Press. Loya, S. (2018). Liszt’s National Compositions in the Year of the Franco-Prussian War. In Kelly, E., Mantere, M. and Scott, D. (Eds. ), Confronting the National in the Musical Past (pp. 31–48). London: Routledge. ISBN 978-1-138-28742-6. Loya, S. (2014). Liszt’s Legacy and the Paradoxes of Hungarian Musical Modernism. In Deaville, J. and Saffle, M. (Eds. ), Liszt's Legacies A Collection of Essays (pp. 17–42). Pendragon. ISBN 978-1-57647-169-2. Loya, S. (2012). Liszt the Transcultural Modernist. In Deaville, J. and Saffle, M. (Eds. ), Liszt: A Chorus of Voices (pp. 220–230). Hillside, NY: Pendragon. Loya, S. (2015). Neither major, nor minor: The Affective Fluctuating Third in Central-European Art Music ca. 1840–1940. Dur vs. Moll: Zum semantischen Potenzial eines musikalischen Elementarkontrasts. Kontinuitäten und Brüche in der neuzeitlichen Musik und Musiktheorie 19-22 November, Institut für Musik wissenschaft Universität Leipzig, Germany. Loya, S. (2015). Auto-Exoticism? The case of Mosonyi’s 'Hungarian Children’s World' and Studies. KeeleMAC 8-10 July, Keele University. Loya, S. (2014). Schenkerian analysis and the transcultural harmony of Hungarian verbunkos'. Part of a Society for Music Analysis panel entitled ‘Traversing Disciplinary and Geographic Continuums’ (chair: Shay Loya). Joint Meeting of the AAWM 2014 and BFE 2014 1-4 July, SOAS, London. Loya, S. (2014). 1838: Liszt’s Schubert and the Arrival of the Heroic Hungarian Masterwork. The 18th Biennial International Conference on Nineteenth-Century Music 18-21 June, University of Toronto. Loya, S. (2014). Liszt’s Transcultural Composition in the Year of the Franco-Prussian War. Third Sibelius Academy Symposium on Music History (Confronting the National in the Musical Past) 21-23 May, Sibelius Academy, Helsinki, Finland. Loya, S. (2010). Nineteenth-Century Folklorism and Lajtha’s Radical Verbunkos Transcriptions. 16th Biennial Conference on Nineteenth-Century Music 8-11 July, University of Southampton. Loya, S. (2008). Listening to Transcultural Tonality. Tonality in Perspective 27-29 March, King's College London. Loya, S. (2007). Paradoxes of Liszt’s Verbunkos Idiom. 18th International Congress of the IMS 10-15 July, University of Zurich. Loya, S. (2006). The Impact of the Verbunkos Idiom on Liszt’s Tonal Practices. 14th International Conference on 19th-Century Music 4-7 July, University of Manchester. Loya, S. (2004). Liszt’s style hongrois between politics and analysis: Issues of transcultural music and postcolonial critique. 13th International Conference on 19th-Century Music 6-10 July, University of Durham. Loya, S. (2016). Dolores Pesce, Liszt’s Final Decade (Rochester: University of Rochester Press, 2014). xiv + 369 pp. £55.00. Nineteenth-Century Music Review, 13(2), pp. 320–323. doi:10.1017/s147940981600015x . Loya, S. (2016). Recomposing National Identity: Four Transcultural Readings of Liszt’s Marche hongroise d’après Schubert. Journal of the American Musicological Society, 69(2), pp. 409–467. Loya, S. (2016). Music and the Exotic from the Renaissance to Mozart by Ralph P. Locke. Notes, 73(2), pp. 289–292. doi:10.1353/not.2016.0128 . Loya, S. (2015). The Mystery of the Seventeenth Hungarian Rhapsody. Quaderni dell’Instituto Liszt, 15, pp. 107–146. Loya, S. (2011). Liszt as Transcriber. Notes, 68(2), pp. 357–359. doi:10.1353/not.2011.0164 . Loya, S. (2010). Representing Non-Western Music in Nineteenth-Century Britain. By Bennett Zon. Music and Letters, 91(1), pp. 115–118. doi:10.1093/ml/gcp024 . Loya, S. (2010). Musical Exoticism: Images and Reflections. Notes, 66(4), pp. 774–776. doi:10.1353/not.0.0348 . Loya, S. (2008). Beyond “Gypsy” Stereotypes: Harmony and Structure in theVerbunkosIdiom. Journal of Musicological Research, 27(3), pp. 254–280. doi:10.1080/01411890802212568 . Loya, S. (2008). Liszt. Nineteenth-Century Music Review, 5(01), pp. 142–146. doi:10.1017/s1479409800002706 . Loya, S. (2008). Franz Liszt and his World. Ed. by Christopher H. Gibbs and Dana Gooley. Music and Letters, 89(2), pp. 256–260. doi:10.1093/ml/gcm097 . Dr Loya's current undergraduate module at city is 'Materials of Music'. 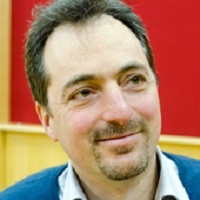 He is designing a new music analysis module for 2016-17, and has contributed in Term 1 individual lectures to 'Investigating Western Music', 'The Classical Style' and 'Researching Music in Contemporary Culture'.